Vulkan Run Time Libraries, sometimes also known as Vulkan Runtime Libraries or VulkanRT, is a 3D graphics and compute API by Khronos Group. The cross platform Vulkan API is available for Windows, Linux, and Android, and was dubbed the "next generation OpenGL" initially. Khronos launched the Vulkan 1.0 specification on February 16th, 2016 and Khronos members released Vulkan drivers and SDKs on the same day. Vulkan may get installed alongside video card drivers on Windows. Nvidia installs those for instance on Windows machines automatically, and does not offer options to deselect the Vulkan Run Time Libraries installation even if you select custom installation during setup of the driver. This is also the main reason why Windows users are surprised when they see Vulkan listed under installed programs in the Start Menu, or when they open the list of installed apps or programs on Windows to uninstall some of them. So, what is Vulkan Run Time Libraries then? Some may fear that the Vulkan Run Time Libraries installation is malicious in nature, since they did not install the library on their own, and did not notice any of the programs that they installed doing it either. First thing you may want to do is check whether Vulkan is installed on your computer. If you use Windows 8 or older, tap on the Windows-key, type uninstall a program, and select the option from the search results. The list of installed programs is sorted alphabetically. Just scroll down to the very end of the list and check whether Vulkan run Time Libraries is installed. Version 1.0.42.1 was installed on the system the screenshot was captured from. If you use Windows 10, use Windows-I to open the Settings application. 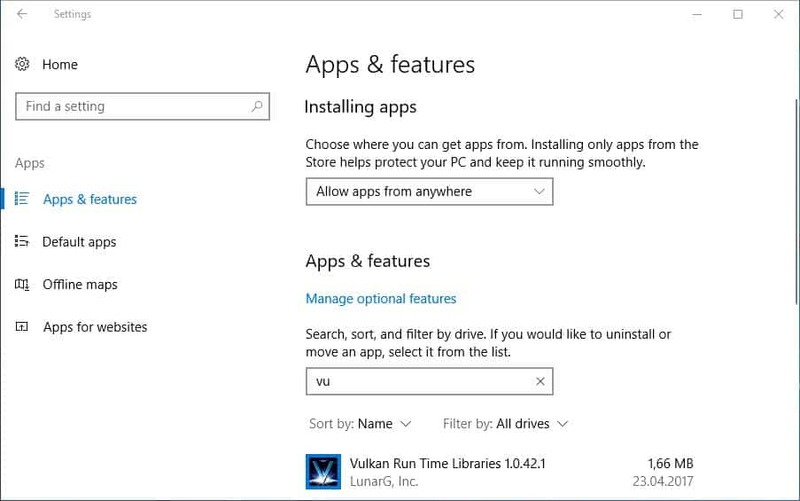 Select Apps > Apps & Features, and type Vulkan in the search box on the page. If you find it listed there, Vulkan is installed, and you may wonder whether you should uninstall Vulkan. Should you remove Vulkan Run Time Libraries? Not all games use Vulkan, and if you are certain that none do, you may uninstall the application without any ill-effect on the system. Games that support Vulkan include Dota 2, the latest Doom game, Star Citizen, and the Talos Principle. Also, Vulkan is support by game emulators such as the Dolphin Emulator, and by game engines such as Valve Corporation's Source 2 engine, CryEngine, Unreal Engine, Unity, and ID Tech. Please note that you cannot install a copy of Vulkan Run Time Libraries manually after you remove the software from your operating system. Games may refuse to run in worst case, and the only option that you have to reinstall Vulkan is to install the graphics driver again. The main Vulkan project page links to graphics drivers for AMD, Intel, Nvidia, Qualcomm and other hardware products. This is the only option to install Vulkan, or update it on a Windows machine. To keep it up to date, you need to install the most recent version of the graphics adapter driver that ships with Vulkan. There you find demo and open source sample downloads as well. These may be useful to test whether Vulkan runs properly on a device. Cross-platform availability. Vulkan supports Windows and Linux, Android, and through third-parties also iOS and Mac OS. Open, industry-controlled, modern, efficient design. Better multi-core support compared to Direct3D or OpenGL. Better control over the graphics processing unit. Now You: Was a copy of Vulkan Run Time Libraries installed on your PC? Windows users are even more suprised , when they see ALL files from VulcanRT detected as a virus by all MS latest versions Malicious Software Removal Tool . On both of my computers with Win10 it finds 60 “infections” , yet when it concludes the scan it doesn’t mention which infection these are . The scan is then normally completed as “OK” ??! Even a completely fresh install of Win10 mentions these “60 infections” immediately after install . I don’t have this problem, weird. I had to install Vulkan to be able to search from qBittorrent and I am very happy about it, since the search is quite efficient, so in most cases I find what I look for without leaving the program window. vulkan is far less invasive than any Microsoft has release so this post holds no weight, just make sure you get Vulkan from a reputable source and bittorrent is NOT reputable.